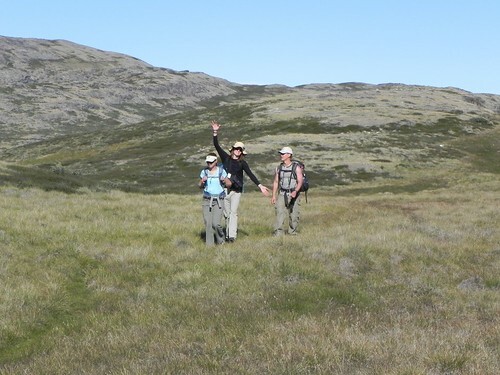 Yesterday, Dr. Eric Post was kind enough to give us a tour of his field site near Kangerlussuaq. It was a beautiful day for the 45 minute drive and 1 hour tundra hike to the site. Eric researches tundra plants and the animals that eat them. He is particularly interested in how the relationship between plants and animals are affected by climate change. Eric has large plots in the tundra that are fenced off to keep out plant-eating animals (called herbivores). He installed these exclosures in 2004 so, after 6 years he has a good idea of what the vegetation looks like when there are no caribou and muskox roaming about and chowing down. He is also interested by how animal and plant relationships (because we all have a relationship with our food, right?) are affected by climate change. For instance, do plants respond differently to warming if there are animals around? At his field site Eric has set up plastic open-top cone warming chambers. The chambers trap solar energy to warm a small area by 2-4 degrees above air temperature, which reflects the warming that we expect with climate change. 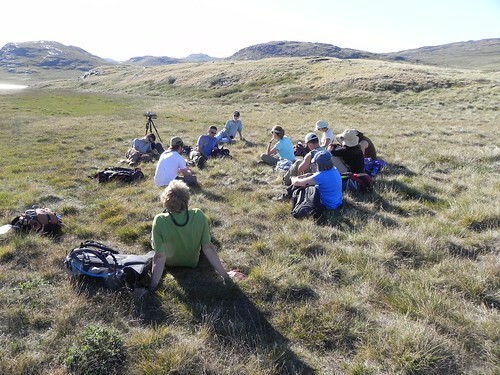 It turns out that when the caribou and muskox are around the plants don’t change with warming, but without the caribou small increase in temperature make the land shrubbier. Why is this important? Well Eric also told us that he has seen a drop in the number of caribou since he first arrived. He doesn’t know if they are moving to a different area, or just not reproducing as much, or what, but he does know that there are fewer in his research area and clearly this has to be accounted for when we think about how the environment and landscape are changing. During our tour we also got to hear about the research that Eric’s graduate students are doing. Mike Avery has been roughing it in the field since May (!! ), doing research on land-based insects. He samples insects every day with pitfall traps, which are are empty plastic cups planted into the ground. He says that the high-frequency sampling is important because there can be insect outbreaks that will come and go in a matter of days! Sean Cahoon is starting some research to understand use, flow and release of carbon below the surface of the ground. As a group we talked a lot about the challenge of studying things that are happening below the ground, where you can’t see them. It was cool to hear some of Sean’s ideas about how he plans to tackle these complications, you know, until someone invents hyper-accurate-soil-penetrating-carbon-detector-laser-vision goggles. The afternoon was stimulating to us all, and made an impression on us about the power of long-term research efforts, particularly to understand environmental change. We are so grateful to Eric, Mike and Sean for taking the time to share their knowledge, experience and thoughts with us!